SEJONG -- It has been 17 years since former Bank of Korea Gov. Park Seung proposed slashing the face value of the nation’s currency upon taking office in April 2002. 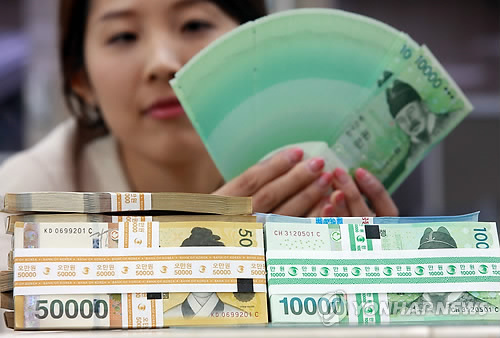 Under Park, the central bank pushed for redenomination in a low-key manner, seeking to do away with 10,000 won, 5,000 won and 1,000 won notes and replace them with notes worth 10 hwan, 5 hwan and 1 hwan. The BOK project, initiated in the fifth year of the government of former President Kim Dae-jung, came to the fore during the tenure of former President Roh Moo-hyun. But it was eventually scrapped, apparently due to the disapproval of senior government officials. A group of lawmakers revived the discussion during the term of former President Park Geun-hye. The matter came into the spotlight in connection with the Park administration’s pledge to prevent large sums of cash from circulating in the underground economy by forcing it aboveground. But again, the plan fizzled out and came to nothing. Since gaining its independence from Japan in 1945, Korea has conducted currency reforms on three occasions -- in 1950, 1953 and 1962 -- redenominating the currency each time. It was the third reform, conducted in June 1962 under then-acting President Park Chung-hee, that saw 10 hwan converted to 1 won. 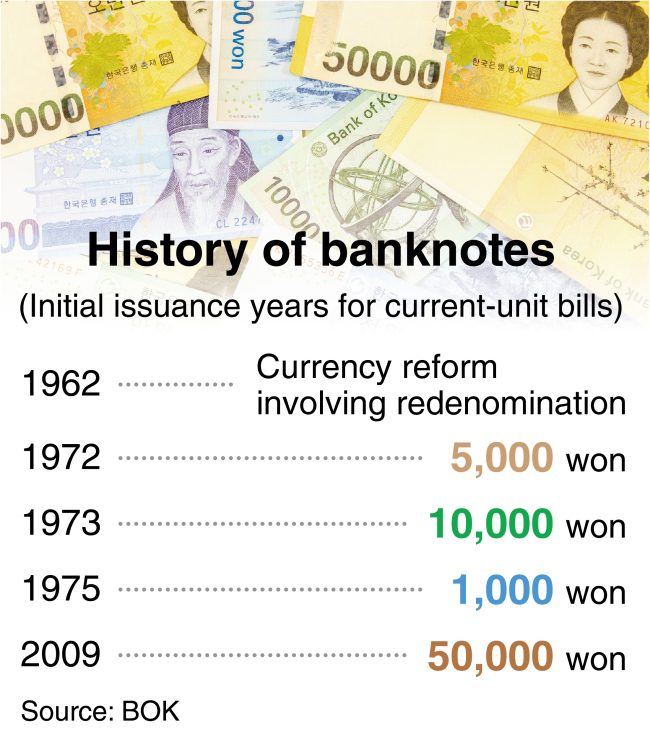 In the 1970s -- in accordance with the 1962 reform -- the most commonly used banknotes made their debuts: 5,000 won on July 1, 1972; 10,000 won on June 12, 1973; and 1,000 won on Aug. 14, 1975. In contrast, it was not until June 23, 2009, that the first 50,000 won bills were issued. He pointed out that the nominal gross domestic product as of 2016 -- 1.614 quadrillion won -- had increased more than 4,000-fold since 1962, when the nation abbreviated the face value for the last time and GDP stood at just 365.8 billion won. An official at Government Complex Sejong predicted that it would not be easy for the 20th National Assembly -- whose term expires May 29, 2020 -- to undertake such an epoch-making endeavor.